The cameras are down at Orrell St James on Saturday when they host Underbank Rangers in the first round of the Coral Challenge Cup. The game is to be screened live on the OuRLeague app, and judging by audiences in the past couple of seasons, the Orrell club can anticipated a lot of interest as rugby league fans around the world tune in on their laptops, phones and tablets. 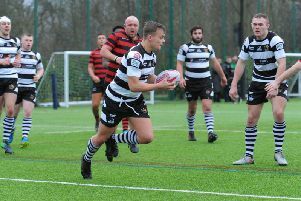 Underbank will arrive as keen favourites due to their finishing sixth in the Kingstone press National Conference League Pay-off last season, where they then went on the see off third placed Thatto Heath. 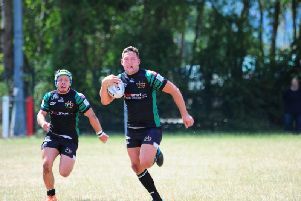 They are a big set who are used to playing on a small, very compact pitch and no doubt St James coach Sean McHugh will have plans to give the Holmfirth based side the run-around. “Hopefully they won’t have done too much homework on us and maybe arrive feeling confident – perhaps too confident,” he said. “They will start favourites and we are happy with that. To us this game is about preparing ourselves to defend our league title. But again, having said that, we have a very competitive bunch of players here at St James who won the league last year, when everything about their age and experience says they shouldn’t have. “In the great scale of things, it was too soon for our plans. But they have always ignored the plans and relished in the challenge, and that is just what I expect them to do this Saturday. “We will go out there and compete, give it our best and see where we are after that. Hopefully we can get the win because it would be great to move into the next round and then be able to see who we improve as our pre-season work intensifies. St James are a side that can create problems and after a home success last year over Northampton Demons 34-0 in Round 1, they then travelled to Kells to only be narrowly defeated 6-4. St James will hopefully have the prolific try scorer Jack McHugh.